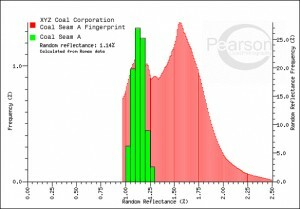 Vitrinite Reflectance | Pearson Coal Petrography - We fingerprint your coals, coke and carbons. The reflectance of vitrinite remains the most definitive measure of coal rank, because, unlike volatile matter from Proximate analysis, it is unaffected by oxidation, by changes of coal type (changes in the inertinite content), or by carbonate mineral content. In our laboratories we use polarized white halogen light, or polarized white LED light to illuminate the sample, and measure the maximum reflectance of 100 vitrinite grains in monochromatic green (546 -nm) light. Our reports show a histogram of the data, and lists the vitrinite types measured together with the statistics of the vitrinite distribution. Among these data are the Mean Maximum Reflectance (Romax), Calculated Random Reflectance, and the standard deviation of the readings. A recent addition in our reporting is a graph that superposes the Vitrinite Random Reflectance histogram on the Reflectance Profile or Fingerprint. Each individual measurement of the Romax analysis is recalculated and displayed as Random reflectance. An example of the graph from a very Inertinite rich coal is shown above. The coincidence of the peaks of these two different types of analyses is a powerful validation of these critical rank data. In these diagrams, single coals that are composed of one population of vitrinite plot as straight-line distributions, the steep slope of which is determined by the standard deviation of the distribution. Two or more mixed populations of coals are recognized by either shallower-sloped lines, or, as the separation of Romax constituents becomes larger, by sigmoidally-shaped curves. In addition, from the ordinate, estimates can be made of the proportions of constituent vitrinite populations, and from the abscissa, the Romax of the parent coal is calculated. These estimates are determined from the inflection points of the curves, or by maximizing the standard deviations of two constituents. These diagrams are a major improvement over traditional histograms, and afford the user a unique ability to monitor changes in blend structure by the substitution of other coals in blends , and to confirm proportions of components in a blend. They will become invaluable as the significance of quality control in parameters other than ash, moisture and sulphur, become increasingly important.